The artist Peter Wagon, who died peacefully on August 26th at High View Lodge, was born in Thornton Heath in 1926, the same year as the Queen, as he often proudly remarked. The course of his life changed with the outbreak of the Second World War. He had been hoping to follow a career in medicine, planning to become a surgeon. However, with the bombing of his school, he had to transfer to a school that did not teach biology, essential for a medical career. This proved to be fortunate as the art teacher at the new school spotted his extraordinary artist talent and recommended that he take this further. Peter's father was not keen for him to follow a career in art but did allow him to study art further. The war intervened again when Peter was called up and had to report to the navy base in Portsmouth. On the train to Portsmouth he realised that all his fellow travelers in the carriage were artists destined to form the Naval Film Unit, making instructional films for sailors. Peter found his time with the unit more instructive than his time at art school and left after the war determined to follow a career in Art. Peacetime found Peter in North London, running a commercial art company with his brother, John. He was commissioned by the Post Office Savings Bank to design a poster to celebrate the Queen's coronation in 1952, a relationship which ran through to the 1970s and Peter's painting of the Post Office in Queensway. At this time Peter met his wife of 61 years, Doris. After the birth of his daughter Vicki, he joined the advertising agency Masius Wynne-Willliams as a visualiser, with responsibility for the accounts of among others, Babycham, Mars chocolate, Bisto, Colgate, Trill and Kit-e-Kat. After his second daughter Sally was born, the family moved to Hemel Hempstead. 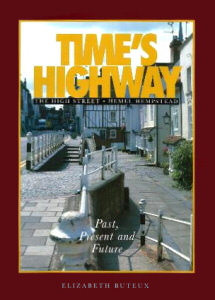 Peter loved Hemel, the New Town with its modern buildings, the charm of the Old Town and the surrounding villages. In 1958, the birth of his 3rd child, a son, Peter, completed the family. In 1965 Peter was offered the chance to hold a one-man exhibition of pictures at Bury St Edmund's Cathedral. The problem was how to produce enough pictures. Peter and Doris decided that he should give up the day job to concentrate on painting. The exhibition was a great success and he was able to become a full time, professional artist. He continued to exhibit in Bury St Edmund's as well as exhibitions all over the South East of England and internationally in New York, Japan and Hemel's twin town in Germany, Neuisenberg. In 1972 the art shop in the Old High Street was due to close, Peter and Doris felt this was an opportunity and with their daughter Sally as the manager took over the business, Here Peter launched his limited edition prints, first in black and white, then in colour of local views. These proved very popular and have sold in their thousands. From his base in the shop, Peter launched himself into the community arts scene of Hemel through the Art's Trust and the town's international festivals. With his friend Clifford Owen he set up the Art Mart exhibitions in the town centre, giving an opportunity to local artists, both professional and amateur, to exhibit their work. Peter's prime subjects were buildings. He had a great love of architecture and the architect James Wyatt on whom he often lectured. He was commissioned to paint some of England's finest houses including Blenheim Palace, Chatsworth, Castle Howard, Longleat and especially Woburn Abbey where he completed over 40 paintings for the Duke & Duchess of Bedford. He loved St Mary's church in the Old Town where he was a trustee and fund raiser and became a prime mover in the successful fund raising to replace the church's steeple in the 1980s. He was always fascinated by the history of the town and the Henry VIII connection in particular. As a member of the High St association he helped to organise the "Hooray Henry" 500th Anniversary week of celebrations. In 2002 the family decided to close the Art Shop, which had now relocated to The Marlowes Centre. Peter continued to paint but was starting to suffer of Alzheimer's disease. Peter enjoyed several years in semi-retirement before the Alzheimer's finally took its toll and he moved into the Highview Lodge Care Home for the last year of his life. Peter was an artist - a special person who encouraged us to see the world through his eyes. Art is a very old human skill - like music it seems to be one of the fundamentals of civilisation. 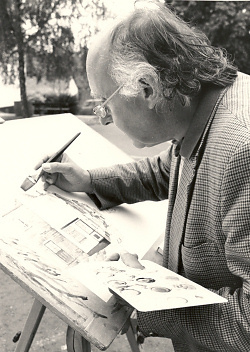 Peter was trained at St. Martin's School of Art and later at Sidcup and Maidenhead Technical College. He painted for his own pleasure of course ----- but also for ours. Using a variety of mediums, particularly watercolours - pen and ink - and pencil he created a picture of his world as he saw it on any given day, whether it was a painting of a stately home, an embassy building, or a half ruined stable block at the back of the old town of Hemel Hempstead. Talking about stately homes Peter painted a total forty two pictures for Woburn Abbey and some of them hang alongside other famous artists like Canaletto in this historic mansion in Bedfordshire. Peter simply loved to paint buildings and interiors and he also painted a number of other stately homes in England and Scotland. Even so the old High Street was one of the places he most loved to set up his easel and drawing board. Unusually he never had a specific place he called a studio. It was here in the old High Street that I had the pleasure of meeting him more than forty years ago; although I was familiar with his work though the many posters depicting rural post offices around the country that he produced for the post office, I had not realised that he lived in the same town as me. Strangely, it was the subject of the swifts that return to breed in lofts and soffits in the old town every summer that first got us talking. Because I'm a working naturalist I was able to answer his questions about these enigmatic birds ... soon, however, our conversation turned to painting, drawing and to artists we knew or admired. Some artists are sensitive and a little shy of letting people see their half completed work, but Peter wasn't at all like that; he loved to share his pleasure in art ... all the more so if you were an artist yourself and we soon became friends. Peter had a little trick, or I should say a technique of painting skies. He would leave the upper part of the picture blank until it was almost finished, then he would turn his painting board upside down and only then would he paint in the sky. It meant that the natural graduation of colour was most intense at the top, almost overhead, and lighter where the influence of the atmosphere affected the way our eyes see colour. This little piece of wisdom gave all of his watercolours natural symmetry and realism. The Borough of Dacorum and Hemel Hempstead is not generally known for its patronage of the arts yet, within its boundaries, it has nurtured more than its fair share of artists and writers. Some like Peter are of international reputation. As I've already mentioned Peter enjoyed sharing his knowledge with budding artists as well as other people who, though not necessarily sharing his talent and technical abilities, derived great pleasure from putting paint on paper or canvas. So when forty years ago the Wagon family took the huge step of opening an art shop and gallery in the Old High Street it became an instant gathering place for those of an arty and not so arty frame of mind .... and from his base the Arts Trust and the Community Art Scheme was born and with it a number of exhibitions were held where local artists, both professional and amateur, with the help and support of his old friend Clifford Owen. My great friend and fellow naturalist, the painter, the late Gordon Benningfield and I, would spend a considerable amount of time discussing with Peter the merits of paints and brushes and paper. Peter was brilliant at choosing just the right paper for a picture ... and sometimes we even spend some money too! One of my enduring memories is when the tower was being repaired and the spire re-leaded and we climbed into the roof space to see how it had been built. I was making programmes for BBC local radio at the time and took the opportunity for us to chat away "on air" about our admiration for the craftsmen of three centuries ago leaving us with this astonishing memorial to their talents and ingenuity ... a relic of an age when only a very few could read or write and virtually everything was made by hand. I expect many of you here today saw the retrospective exhibition of some of Peter's many pictures shown in the Marlowes Centre recently and were impressed by the breadth and quality of his talent. It was a demonstration of the affection he inspired that so many people took time to enjoy his work and add their own reflection on their memories of Peter. I sure you will feel a personal sense of loss at Peter's death and will share my sympathy with his family .... One thing must be said though ... through his vision, his art and his personality he leaves many happy memories and the world is a better place for his having been part of it. Peter was a friend of this church [St. Mary's] in every way, therefore it is fitting that this memorial service should be held here in St Mary's because it is true to say that he loved this building. He painted the church many times and did many small sketches of internal details, a number of which were used in a guide book of the church. He had a way of looking at the building as an artist and he saw many details that even those who are familiar with the church, fail to appreciate or even notice. Some years ago he gave a very fine talk about 18th century architecture and the work of James Wyatt which displayed his knowledge and understanding of period architecture and buildings in general. When the 14th century spire of this church was in danger of collapse, he became a founder member of the Friends of St Mary's formed in 1980 to raise funds for the repair of the spire in order that it could be preserved for future generations. He became a member of the Appeal Council that was set up to save the spire and later a member of the Friends Council and finally he was invited to be a Trustee. Not content to be an armchair friend of St Mary's he designed and produced appeal literature, posters, letter heads, tickets and was full of ideas and schemes to raise money towards the massive sum of £250,000 required to repair & reclad, this unique lead spire. One of his most imaginative ideas was to produce an Illuminated scroll for calligraphers to write the names of donors to the appeal, after it had been signed by Her Majesty the Queen Mother. Those sheets with hundreds of names along with typical items of the period, stamps, coins, newspapers etc are lodged in a casket like a time capsule in the spire above us. Another venture, for the Millenium Year was to produce & sell calendars of local churches in Dacorum that he had painted, featuring the Gaddesdens, Markyate, Flaunden, Bovingdon, Berkhamsted, Flamstead, Tring etc with a front cover of this church, St Mary's. Colouring in peoples' lives is a gift that few can do. To be touched by Peter Wagon turns life multi-coloured by you. Vicky, Sally, Peter, the Wagon gift is passed to you. Grandchildren; Roz, Pearl and Paddy, painting life's canvas now. Still colouring in with love and care.